I asked for the post-holiday scoop, and readers dished. Hopefully today’s Q&A will help others avoid seating scenarios gone wrong at their next party. Please send along your solutions too. Q: At Christmas dinner the hostess (my sister-in-law) requested a favor: that the other single adult guest and I sit at the kid’s table (age range 7-21). I’m family (the other guest was not) so I obliged, but still felt very put off. Was I wrong to feel slighted? A: There are several things wrong with this scenario, but your feeling of being snubbed is not one of them. Making people feel welcome is the heart of sharing your table and home. It’s unfortunate that your sister-in-law missed this basic, important detail. Especially since I’m sure she worked hard to shop, cook, clean, etc. for the dinner. Not only did she assign seats, but rank as well. 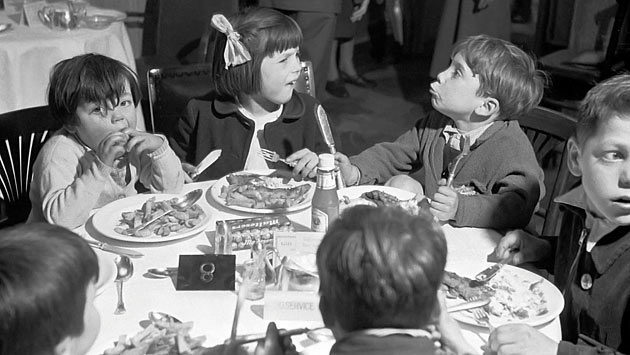 Despite the fact that you and the other guest were nearly twice the age of the oldest ‘kid’, those without a plus one were considered lower in the adult table pecking order. That is the more disappointing reveal of your host’s character. We can’t remedy that, but this seating fiasco could easily have been avoided. *Disrupt the decorative tablescape and squeeze in two more places. It’s possible. This Christmas we had 11 adults at a table that comfortably seats six. It was like one of those annoying story math problems, but I was determined that no one be farmed out to the couch (all of 5 feet away, but still). 10 proper chairs, one shoehorned in stool later and, elbow to elbow, we dined together. *Forgo the kid vs. adult table and mix up the seating chart. I have a friend who likes to separate couples which is a nice change. But the cross generational set-up is usually a guarantee for interesting turns in conversation. Warning: grandma might get hip to Twitter and start following you. *Serve buffet style. Set smaller tables and let people land where they will. *Hosts take the hit. If committed to a sit down deal with a precise number at the table, then the hosts should accommodate their plan by sitting at the kid’s table. This entry was posted in Ps&Qs and tagged entertaining, seating etiquette by lhouse. Bookmark the permalink.